I pondered the other day whether anyone had ever erroneously put content into fields on the wrong Sitecore item, only to discover they had erred after laboring away for an extended period of time — imagine the ensuing frustration after realizing such a blunder. You might think that this isn’t a big deal — why not just rename the item to be the name of the item you were supposed to be putting content into in the first place? Well, things might not be that simple. What if the item already had content in it before? What do you do? This hypothetical — or fictitious — scenario got the creative juices flowing. 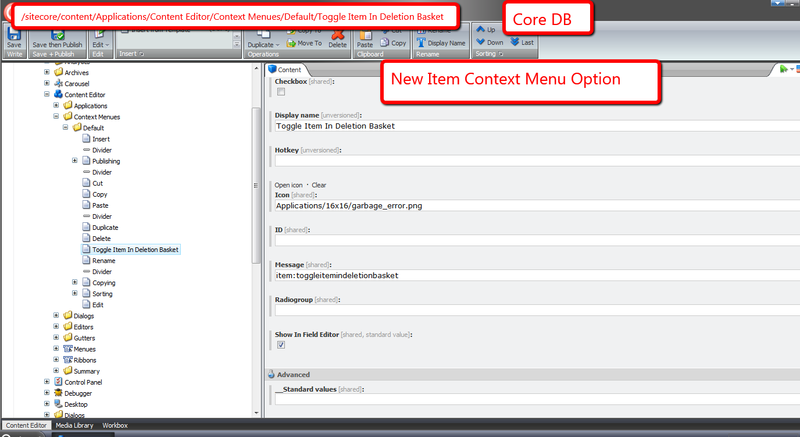 Why not create new item context menu options — check out part 1 and part 2 of my post discussing how one would go about augmenting the item context menu, and also my last post showing how one can delete sitecore items using a deletion basket which is serves as another example of adding to the item context menu — that give copy and paste functionality for field values? I find these three menu options to be indispensable. I frequently use them throughout the day when developing new features in Sitecore, and have also seen content authors use these to do their work. The only problem with these is they don’t work at the field level, ergo the reason for this post: to showcase my efforts in building copy and paste utilities that work at the field level. Instances of the above class delegate down to repository objects that save strings using strings as keys. 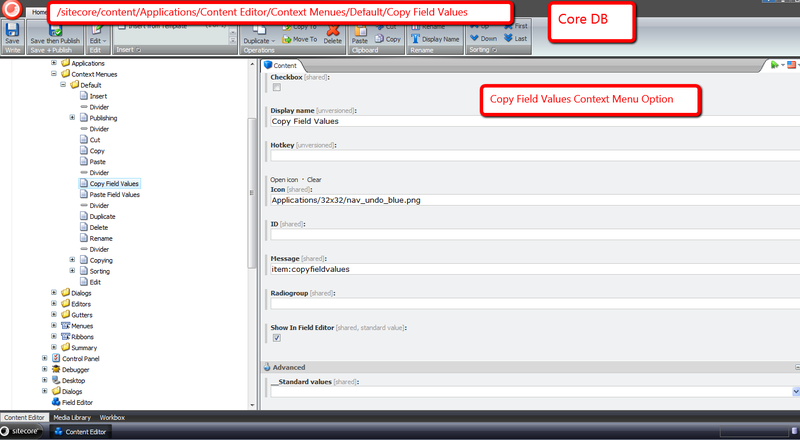 The above command iterates over all fields on the currently select item in the content tree, and saves their values using an instance of the IDValueRepository class. 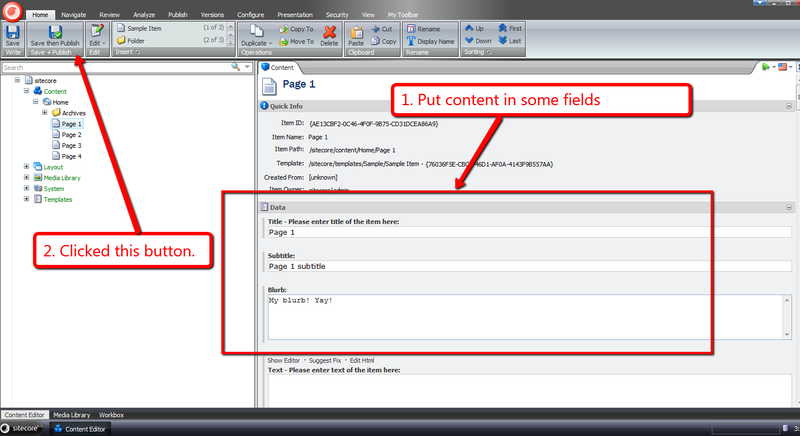 The paste command determines if the target item has any fields with content in them — a confirmation dialog box is displayed if any of the fields are not empty — and pastes values into fields if they are present on the item. 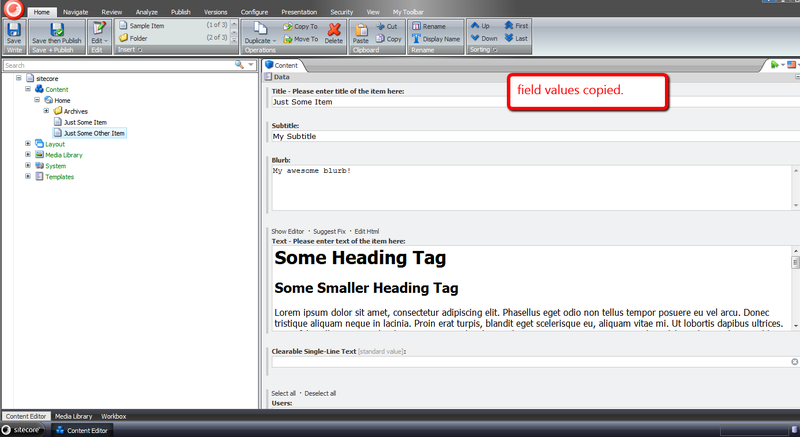 Plus, once a field value is retrieved from the IDValueRepository instance, the above command removes it. I couldn’t think of a good reason why these should linger in session after they are pasted. If you can of a reason why they should persist in session, please leave a comment. Let’s take all of the above for a spin. In retrospect, it probably would have made more sense to omit standard fields from being copied, albeit I will leave that for another day. For the past week, I’ve been battling a nasty strain of the rhinovirus — don’t worry, that’s just the fancy medical term for what is known as the common cold — albeit there appears to be nothing common about this cold. I think I have a frankencold (I just made up this word, and might submit it to Merriam-Webster for inclusion in the English dictionary). In my sickened state — perhaps it could be classified as a state of frenzy — I started pondering over strange feature ideas. The ‘Dislike’ button was one idea that came to mind. It would serve as the antithesis to the ‘Like’ button found on most social networking outlets. Such a feature would definitely be a whimsical thing to build, although might foment more trouble than it’s worth. 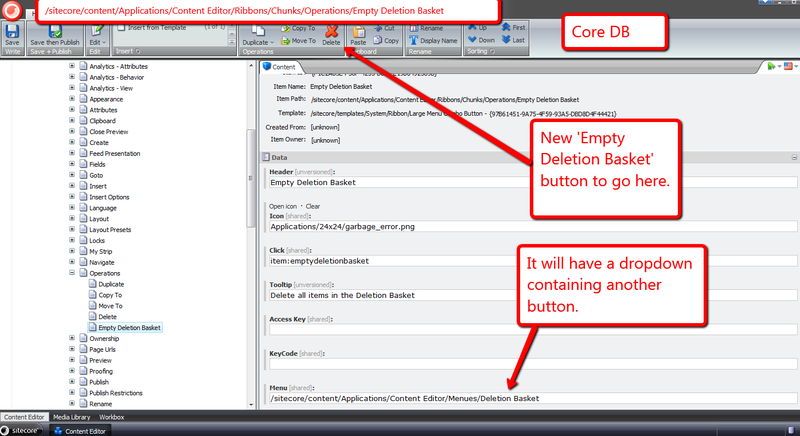 Another idea that came to mind was a deletion basket in the Sitecore client. It would be similar in theme to a shopping cart found on most e-commerce websites. 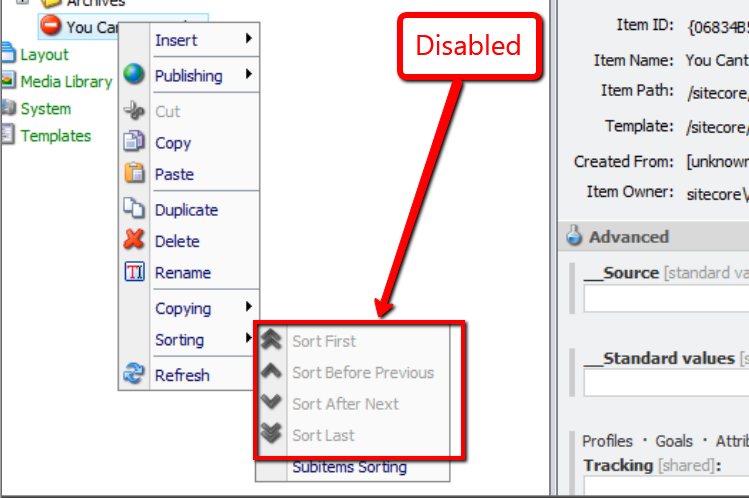 Users would queue items in their deletion basket, and delete them after they are finished adding items — a checkout step for the lack of a better term. The latter idea seemed useful — most importantly fun — so I decided to build it. 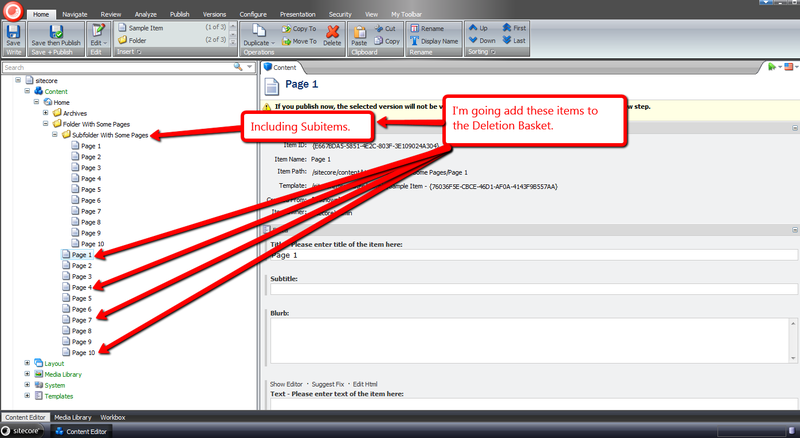 The above class stores and deletes items from a list, and prompts users ascertaining if they truly want to delete items within the deletion basket. Only one instance of the above class can exist — I employed the Singleton pattern for this purpose — to keep the code simple for this blog post, although it probably would make more sense to make baskets session aware — have different baskets for different sessions. 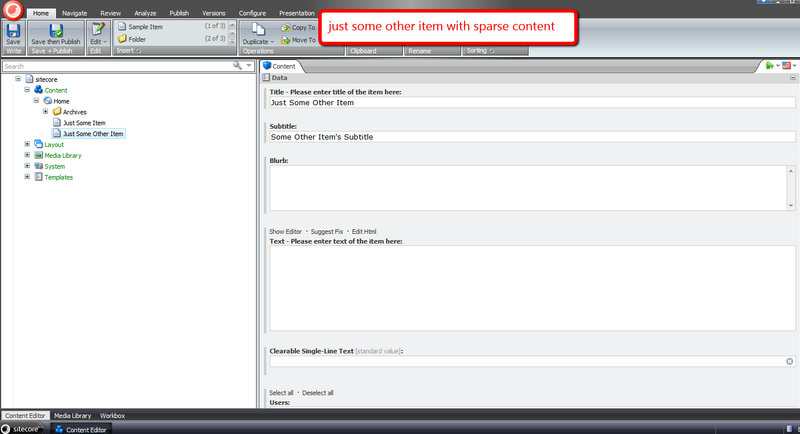 The text of the command is different when the item is in the basket versus when it is not. 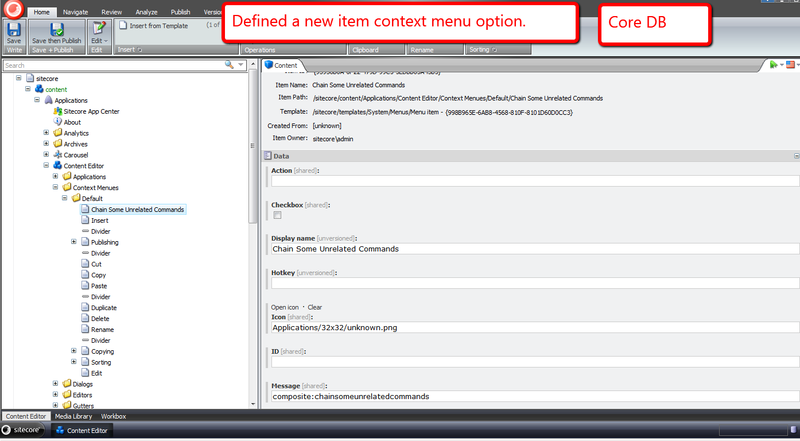 The command also reloads the item in the Sitecore client — this is done to update the state of the deletion basket buttons in the ribbon. This command also reloads the Sitecore client — using the the parent item of the first item flagged for deletion (you can’t reload an item that was already deleted). This is also done to refresh the state of the buttons in the ribbon. 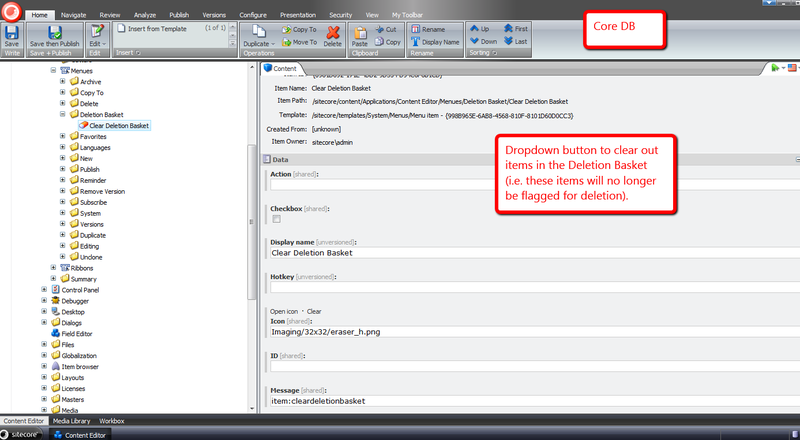 Plus, the command is hidden when there are no items in the deletion basket. 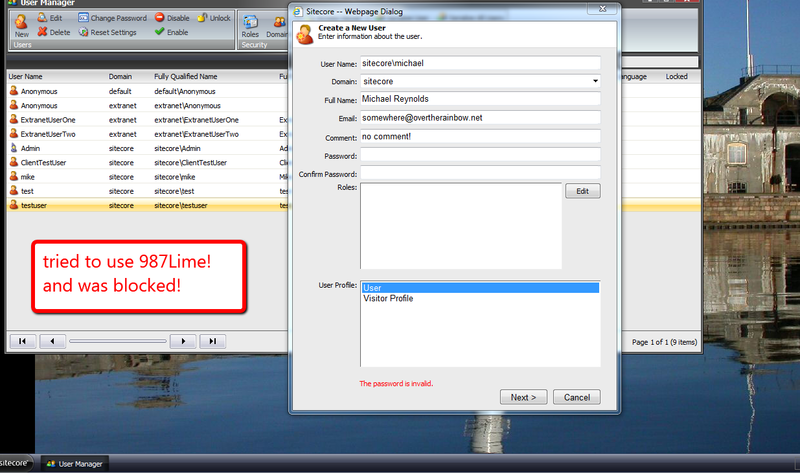 Now that our commands are defined in /App_Config/Commands.config, we can now wire them up in the Core database. 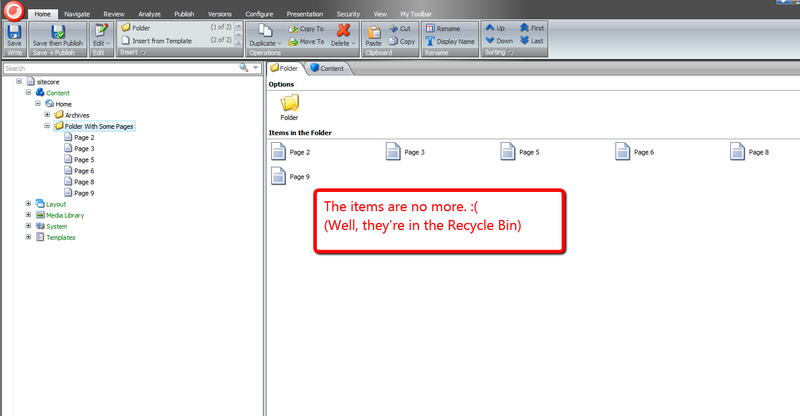 The appropriate wording is displayed since the item is not in the Deletion Basket. 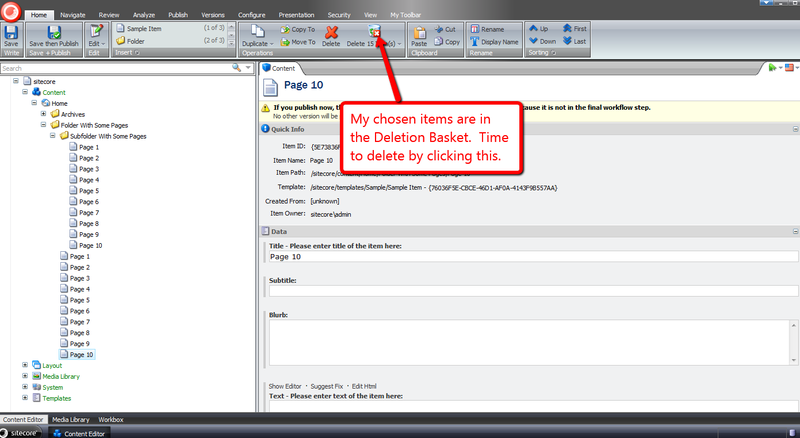 We see that button’s text has changed to convey that this item is in the deletion basket, and can be removed from the deletion basket by clicking the item context menu button again. 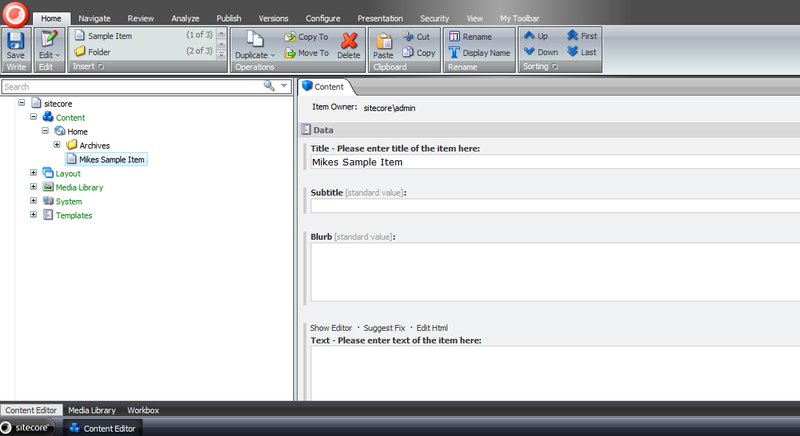 Plus, the deletion basket buttons in the ribbon have magically appeared. That was all in good fun. 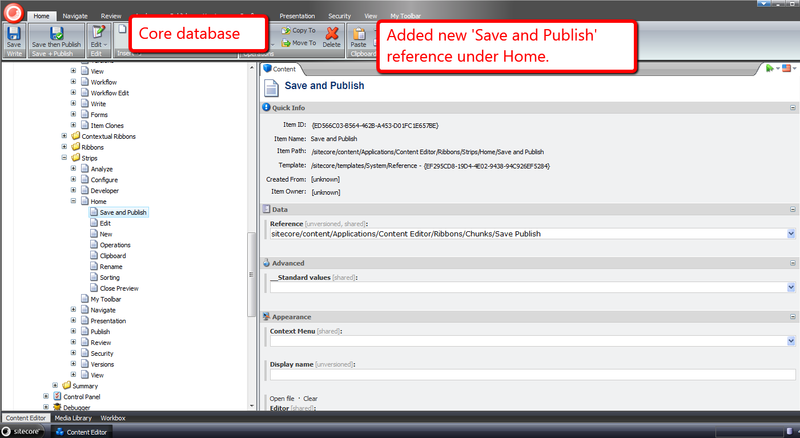 Today, I procrastinated on doing chores around the house by exploring whether one could chain together Sitecore client commands in order to reduce the number of clicks and/or keypresses required when invoking these commands separately — combining the click of the ‘Save’ button followed by one of the publishing buttons would be an example of this. Immediately, the composite design pattern came to mind for a candidate solution — you can read more about this pattern in the the Gang of Four’s book on design patterns. 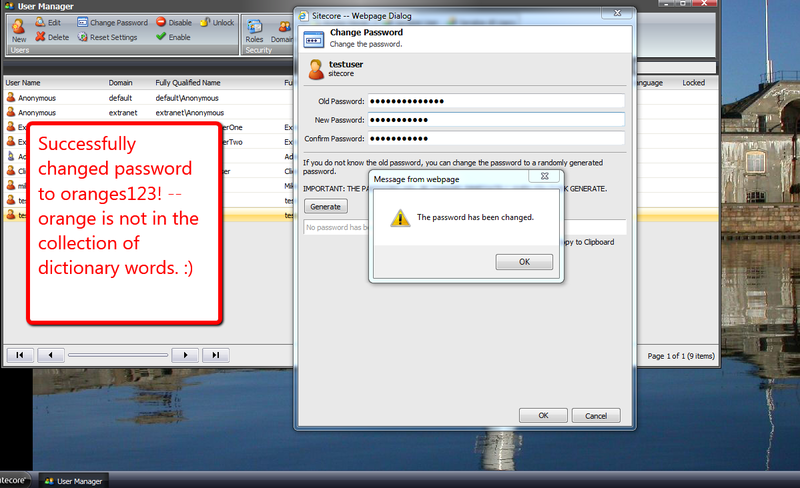 This high-level plan of attack lead to the following custom composite command. The above command — using the Sitecore.Configuration.Factory class — gets its XML configuration element; parses the list of commands it wraps from a new attribute I’ve added — I’ve named this attribute “commands”; gets instances of these commands via Sitecore.Shell.Framework.Commands.CommandManager (from Sitecore.Kernel.dll); and invokes all Command instances’ Execute() methods consecutively — ordered from left to right, separated by pipes, in the “commands” attribute on the command XML element in /App_Config/Commands.config. To test this out, I thought I’d create a composite command combining the item save command with the publish command — the command that launches the Publish Item Wizard. Now, it’s time for some fun. Let’s combine commands that make little sense in chaining together. 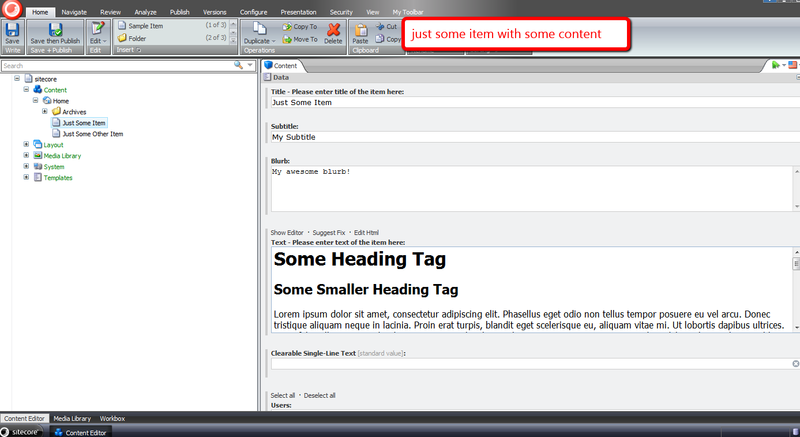 Out of the box, Sitecore creates and utilizes subclass instances of Sitecore.Layouts.PageExtenders.PageExtender — this class resides in Sitecore.Kernel.dll — to hook in functionality for Preview and Debugging features of the Page Editor — check out this post by John West where John discusses these — and all PageExtender instances are called upon to insert their controls onto pages via the PageExtenders pipeline processor in the renderLayout pipeline. 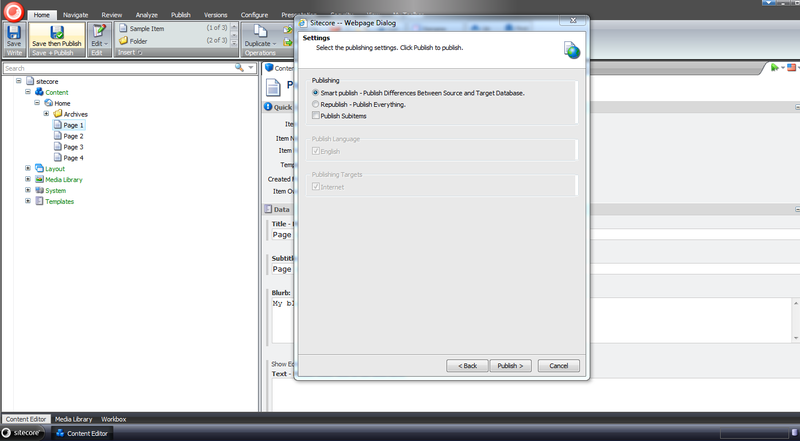 Last night, I hankered to explore the possibility of using a custom PageExtender outside of Sitecore’s Page Editor as an alternative route for placing content onto rendered pages in my local Sitecore sandbox instance. I pretended I was meeting a business requirement for a fictitious company that has a website where important information is to be displayed in a big red box at the top of every page to its website visitors when applicable. 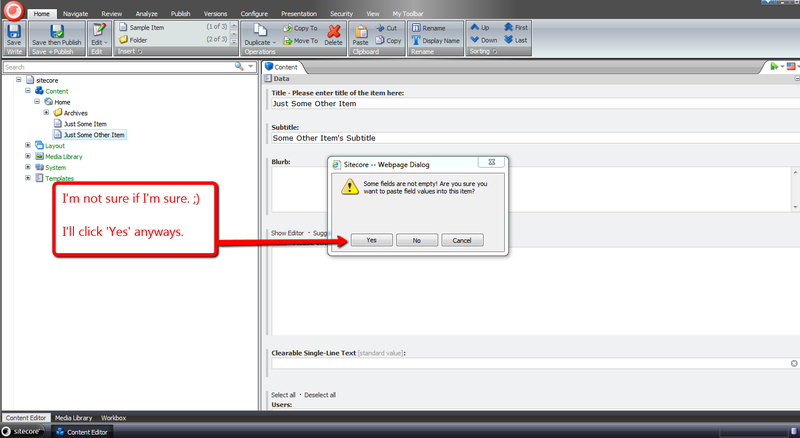 Alert items can contain alert copy in its Alert Text Single-Line Text field. The above PageExtender inserts an instance of a FieldRenderer — that will render content from our Alert item’s Alert Text field above — into nested ASP.NET Panels. I give the outer Panel a CSS class to position these ASP.NET controls at the top of the page, and decorate it with a red background and large white text font — I’ve omitted this CSS from this post for the sake of brevity. As you can see, our red alert box displays at the top of the page. This page also contains our red alert box. As you can see, our red alert box is now gone. All of this is wonderful — inserting controls globally in this manner could potentially be a project saver when needing to add content to all pages in a pinch. However, it’s also a double-edged sword. 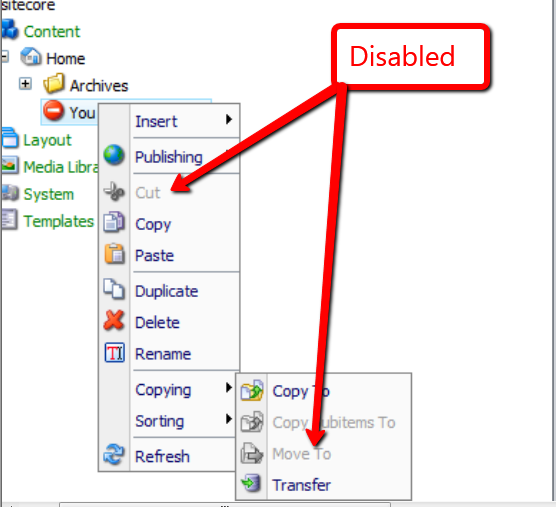 Such a solution might force the insertion of controls onto pages without the option of removing them using Sitecore’s presentation framework of adding/removing renderings. Given these two salient factors, I would strongly recommend being conservative around using custom PageExtenders for displaying content on your Sitecore webpages. without overriding the individual commands. The above abridged version of my Web.config contains an XML comment underscoring what this pipeline should be used for: disabling and/or hiding buttons in the Sitecore client. Although I am still unclear around the practicality of using this pipeline overall — if you have an idea, please leave a comment — I thought it would be fun building one regardless, just to see how it works. Besides, I like to tinker with things — many of my previous posts corroborate this sentiment. What I came up with is a getQueryState pipeline processor that disables buttons containing move related commands on a selected item in the content tree with a particular template. Sorting commands also fall under the umbrella of move related commands, so these are included in our set of commands to disable. The above pipeline processor checks to see if the selected item in the content tree has the unmovable template I defined, coupled with whether the current command is within the set of commands we are to disable. 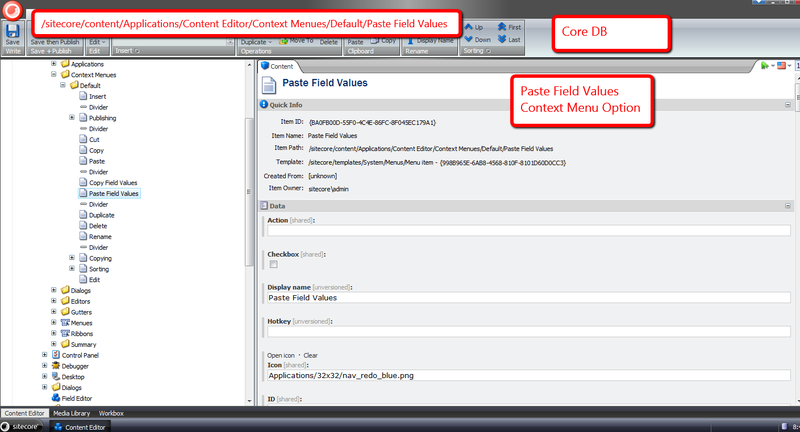 If both are cases are met, the pipeline processor will disable the context command. There really wasn’t much to building this pipeline processor, and this pipeline is at your disposal if you ever find yourself in a situation where you might have to disable buttons in the Sitecore client for whatever reason. However, as I mentioned above, I still don’t understand why one would want to use this pipeline. If you have an idea why, please let me know. 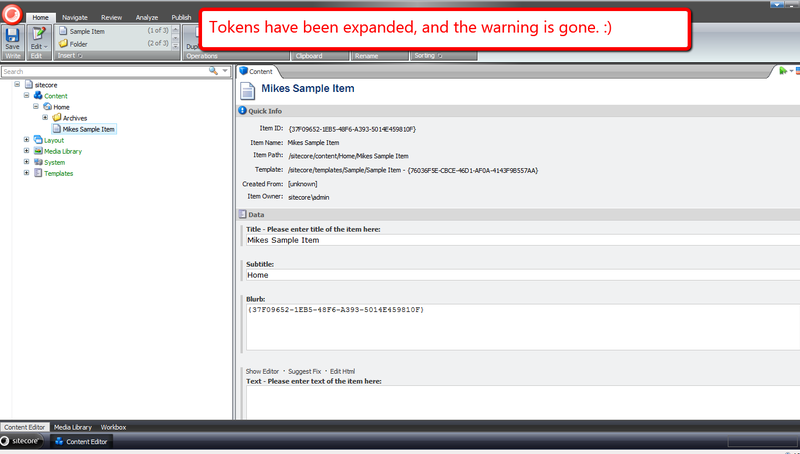 This can occur when tokens are added to an item’s template’s Standard Values node after the item was created — tokens are expanded once an item is created, not after the fact. 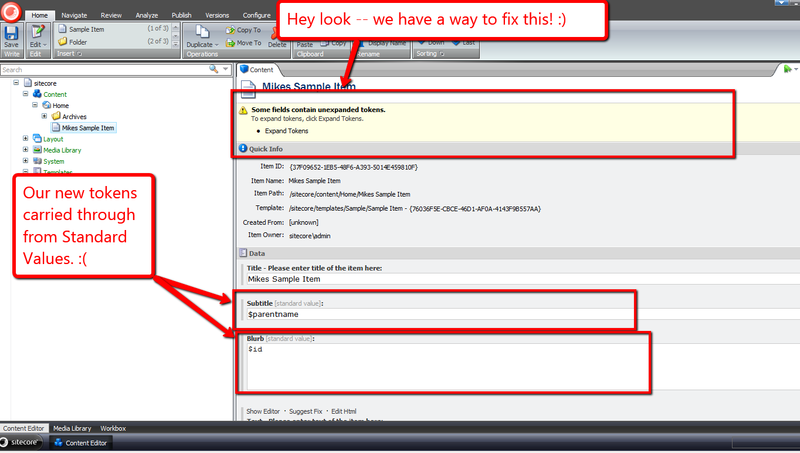 John West wrote a blog article highlighting one solution for eradicating this issue by using the Sitecore Rules Engine. In this post, I am proposing a completely different solution — one that empowers content authors to expand unexpanded tokens by clicking a link in a custom content editor warning box. All of our “checkers” will have a “Source” object, a collection of substrings to look for, and a method to convey to calling code whether a substring in the collection of substrings had been found in the “Source” object. I decided to create a base abstract class with some abstract methods along with one method to serve as a hook for asserting the Source object — albeit I did not use this method anywhere in my solution (come on Mike, you’re forgetting YAGNI — let’s get with the program). The first “checker” I created will find substrings in a string. It made sense for me to start here, especially when we are ultimately checking strings at the most atomic level in our series of “checker” utility objects. The next level up from strings would naturally be Fields. I designed this “checker” to consume an instance of the string “checker” defined above — all for the purposes of reuse. The field “checker” delegates calls to its string “checker” instance. If I were to ask you what the next level up in our series of “checkers” would be, I hope your answer would be Items. 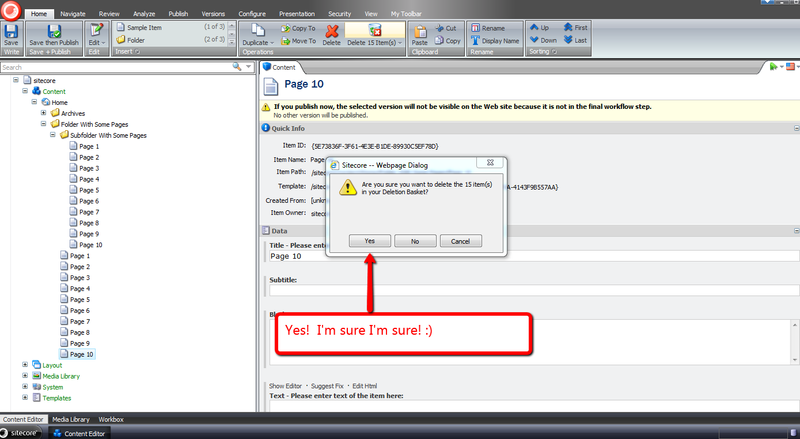 Below is a “checker” that uses an Item as its “Source” object, and delegates calls to an instance of a field “checker”. In my pipeline above, I am pulling a collection of token names from Sitecore configuration — these are going to be defined in a patch include file below. 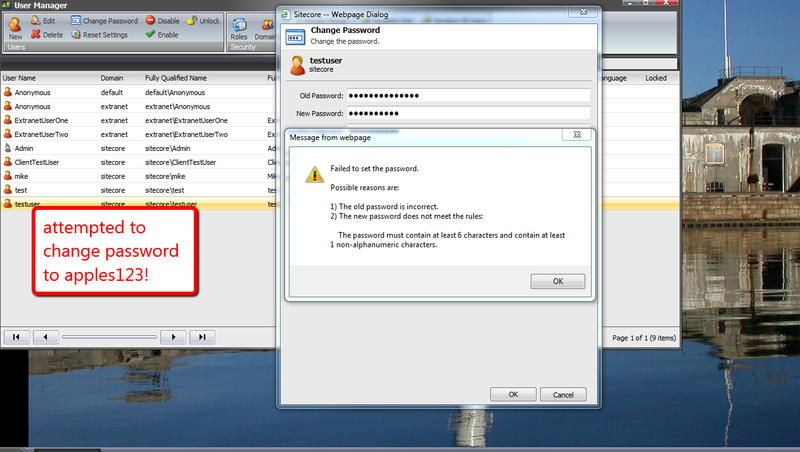 I had to go down this road since these tokens are not publically exposed in the Sitecore API. Plus, we should only allow for the expansion of tokens when not on the Standard values item — it wouldn’t make much sense to expand these tokens here. 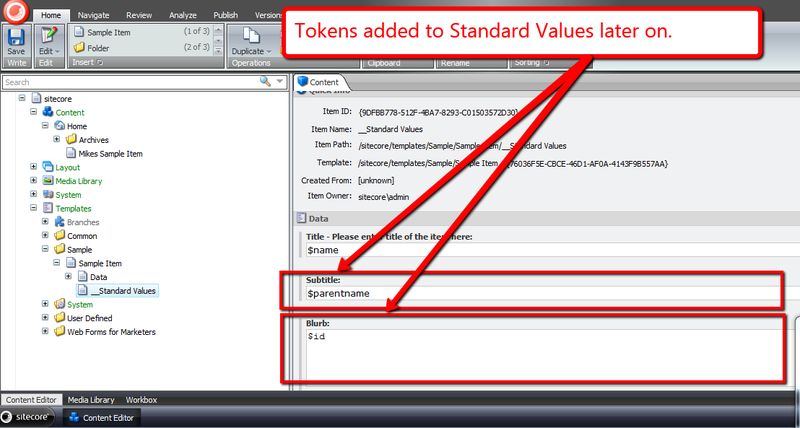 This new command just uses an instance of Sitecore.Data.MasterVariablesReplacer to expand Standard Values tokens on our item. As you can see, the item’s Title field was populated automatically during item creation — the $name token lives on this item’s template’s Standard Values item in Sitecore and was expanded when we created our test item. 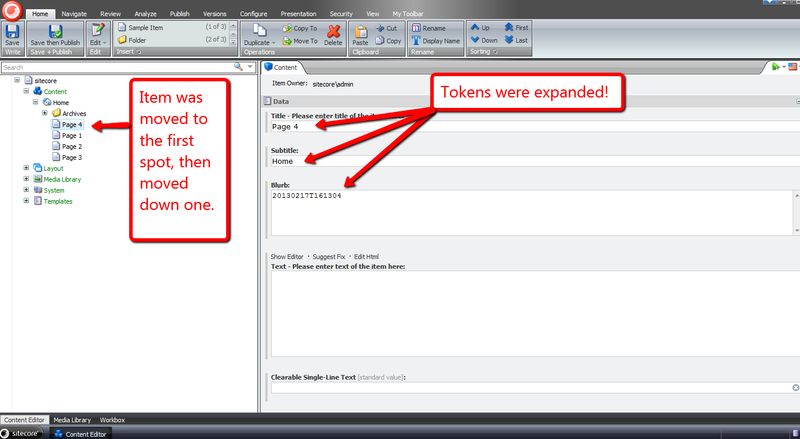 Hopefully, this post has given you another weapon to add to your arsenal for solving the unexpanded tokens issue on existing items in Sitecore. If you find another solution, please drop me a line — I would love to hear about it.